My limited knowledge of historical fiction makes it difficult for me to name an English language equivalent, but The Brethren neither seeks to recreate the world of the powerful as Wolf Hall does, nor use history as a backdrop to a different kind of story as in The Name of the Rose. Instead there is a clear intention to demonstrate the historical events of the time as they affect characters who are neither at their centre or entirely removed from them. The above quotation also gives a sense of the voice of the novel which seeks to echo an older rhythms of English without containing too many archaic terms. This can seem a little slow at times, particularly initially when Pierre is recounting events that took place before he was born. However the original novel was written in the French of the period (described on Wikipedia as ‘virtually untranslatable’) so it would have been a betrayal of the source to translate into an entirely contemporary English. For lovers of historical fiction, the novel is rich with detail and contains some wonderful scenes demonstrating the dangers of the time, such as when the chateau is attacked by gypsies or when order collapses in the local town as the plague takes hold (an early version of The Walking Dead). Most dangerous of all is the two Jeans’ Protestant religion (not shared by Siorac’s wife or by their servants) which they initially keep hidden – a decision as to whether to make it public is one of life and death. A lighter strand is provided by de Siorac’s inability to control his lust (much disapproved of by de Sauveterre) giving Pierre a half-brother, Samson. Pierre seems to be following in his father’s footsteps given his nightly adventures with the servant’s daughter Helix. Although there a number of strong and sympathetic female characters, it has to be said they can veer towards cliché at times and it is the men who are the clear heroes of the story. (Of course, this may change in later volumes). 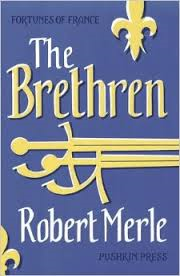 The Brethren is a very pleasurable way to learn about 16th century France. Its style means it lacks the impact of Wolf Hall and it is certainly not as knowing as The Name of the Rose, but for those who enjoy historical novels I suspect they will want to follow Pierre on his journey as he leaves Mespech in the final pages. You are currently browsing the archives for the Robert Merle category.